The deceleration (drogue/drag) parachute assembly was developed in 1960' by the U.S. Air Force for deceleration of the aircraft while landing. It is a circular ring slot canopy that is made up of 20 gores and 20 suspension lines. 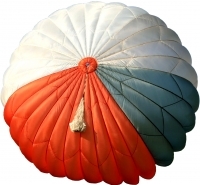 The B-12/20 emergency parachute assembly is a basic non-automatic back style parachute. The B-12/20 consists of a standard C-9 canopy, risers, pilot parachute assembly, cushion, harness and pack assembly (which incorporates a D-handle ripcord grip) and two PCU-4/P canopy releases. The BA-22 emergency assembly is a high speed emergency parachute system. This back style parachute is configured for use in fixed wing aircraft, such as: C-141, C-130, KC-135, B-52, C-5, F-5, T-37, T-38, A-37 and F-100. The BA-22 emergency assembly is currently used by Air Forces world wide.